Tangled and True: fathers day medley. I've heard it said that the way to a man's heart is through his stomach. In that case you're sure to please with Dancing Deer Baking Co. They've been featured before and we're thrilled to bring them back in honor of Father's Day. 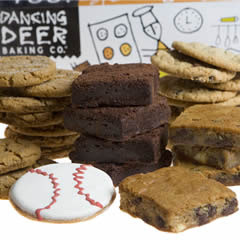 They have a wide assortment of amazing cookies, cakes, brownies and more, perfect for the dad's in your life. My Dancing Deer pick? The Father's Day Medley pictured above. It's a gift box full of deliciousness. Blondies, Chocolate Chunk brownies, Chocolate Chip cookies, Molasses Clove cookies (my very favorite) and a decorated vanilla baseball cookie. 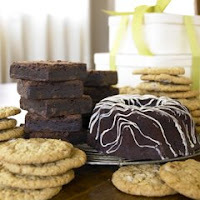 But don't stop there, be sure to check out all their Father's Day gifts, including the Father's Day Tie Tin, Brownie, Cake & Cookie Tower, and the Brownie Sampler. There's something for everyones liking, and enough variety that they'll never know if you sneak a taste for yourself. Today Dancing Deer wants to help you celebrate the Dad's in your lives by offering two Tangled and True readers the Father's Day Medley (a $30 value). Why do you want to win one for the "dad" you're celebrating this Father's Day? note: winners must contact us by Tuesday (6/10) 8 am in order to claim their prize. I would want to win this for my husband because he's sure to share some of it with me! My daughter Madeleine, three, says that she loves deers :) so Daddy would love to have these deer cookies for a present. She would, of course, make sure all the deer cookies were gobbled up. Because my husband is a marvel. He never gets upset, he always trys hard to help out and he loves his family to pieces. This guy would give you the shirt off of his back if you needed it. Plus, he lets me stay home with our son and works hard to provide for us so we can get everything we both need and want. I love this man- and because he is so sweet, he deserves an especially sweet treat in honor of all of his love and devotion! My husband needs some sugar to help him "deal" with our 3-1/2 year old triplets and the 6 month old. By the time he gets home from his 11 hour work day I am more than ready to hand over the wheel and he usually handles everything indcluding baths and some snuggletime to give me a little break (ie fix dinner). My hubby and I love the Dancing Deer Molasses cookies! We're obsessed. And the poor guy, who is so amazing and sweet and kind and a joy around our daughter, he barely gets to enjoy them because I'm a beast and eat them all up before he gets to them! Oh he would love this! Oh my ... brownies actually delivered!? You can't get any better than that! Though our first baby doesn't make his or her debut until September, this is certainly my husband's first Father's Day and I hope to make it special for him in as many ways as I can. He deserves all my love and thankfulness for being such an amazing man to me and our growing family. Because he makes me want to dance! I would like to win this for my husband who is the hardest working person I know. He has a sweet tooth, so this would be a nice treat for him, and he deserves it! I'll take the father's day medley for him (with the blondies for me!). Yum. I'm hungry just reading about these. My kids' dad, aka my husband, is the best. He'd do anything for his little ones - and he does. He even took them to mcdonalds last night and let them play on the playground (their mean mom never lets them do that) while I put on a baby shower her at my house. My man has the biggest sweet tooth ever...he would be loving ALL of these goodies, especially the chocolate ones. I would love to win one for my husband - when he's sick in bed (like he is right now) I realize how our family couldn't live without him! He does so much for me and the kids. He would totally love some delicious treats that someone else made - because he's the resident treat maker here! When we first got married, I made my husband chocolate chip cookies every single Sunday, and always had to make one HUGE one, because those are his favorite. Since we've had kids, that tradition has fallen by the wayside because there is always so many other things to do. I'd love to give this to him as a reminder of those carefree early days in our marriage, and as a way to tell him that he's the best dad in the world (while this mom leaves something to be desired!). My husband loves a good and sweet treat, especially after studying all day and going to class. He has physic's class to finish in 4 weeks and this would help to pull him through! I hope I win! My husband is a CHOC-O-HOLIC! Worse than me! :) He would love this gift and trust me he deserves it. He really earned his Father's Day gifts this year - taking over ALL duties while I've been on bedrest for the past 10 weeks! My husband is a first time father and is incredible. And he loves a good treat. mmm... I think hubby would like the chocolate chunk brownies.The man loves chocolate more than I do! His kids are grown and they don't even bother to call or send a card; I try to make his FD as nice as I can. The kids will call when they need him. This is my husbands first year as a dad so we are trying to make it as special as possiblr. These would be a great gift. My husband would LOVE LOVE LOVE this! And the Father's Day Melody would just be perfect! He definitely has the sweet tooth to need this! This is my husband's second father's day. He's an awesome father and our little darling adores him. day. He was so good to me on mother's day and treated me to breakfast in bed and sometime at the spa. He really deserves this. Thanks! yummy, those vanilla sugar cookies look so good. It all looks so good! When we got married, everything revolved around the bride (me). Now that we have kids, everything is focused on them. A delicious Father's Day Medley may not change the status quo, but premium chocolate chunk brownies are the best way I can think of to show my husband my world will always revolve around him! My husband is a cookie monster! I'm sure he would love these. Also, it would be a great way to thank him for working so hard so that I can stay home with Jacob. I want to win this for my Dad because I have no idea what to get for him! He is very VERY VERY hard to shop for! Any time you ask either of my parents what they want at a time that presents are given (i.e. christmas, birthdays, anniversaries, etc.) they say, "I don't know. I don't need anything. There isn't anything I can think of." It is very frustrating! I NEED the help! I want to win for my husband because he is a wonderful father and great at sharing. I want to win this for my husband, the ultimate brownie expert, because he models love, patience and most importantly, humor with our children. I am so lucky and could not do this humbling job without him. We would love to win this for "daddy" because our youngest has severe food allergies and we can't keep baking stuff in the house! So we can't make home made stuff! This could be close to home made as we could get! He deserves it because we have dealt with a lot this year with the babies allergies! 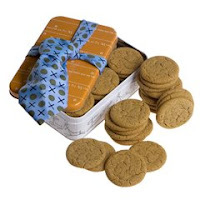 my hubby LOVES molasses clove cookies... what a wonderful, sweet surprise that would be! I want to win this for my husband cause he's just the best dad EVER!!! i would like to win this for my husband, maybe then i can steal a bite! My husband would love these. I'd love to win this for him because he's so very sweet himself! And I know he'd share. My husband would love this, and he deserves it because I haven't really done anything for him since my own dad dies 4 years ago. He deserves it though he is an amazing dad of three. My husband LOVES sweets and as a hard working daddy of three, deserves some sweetness on father's day. My husband loves a good cookie and sadly I have never made him cookies or browines that he truly loves. Maybe he'll find a favorite among these! And I'll be off the hook in the dessert department. My husband loves special treats, and I love to bake them for him, but by the time Father's Day rolls around in June, it is just too hot for me to bake anything, given the fact that we don't have air conditioning. I would love to surprise him with some goodies for Father's Day. I'm sure it would make his day. Because my father has been a type 1 diabetic for over 30 years and he likes to pretend he can't/won't eat sweets, but then he later steals cookies and brownies from my dessert plate! It would be nice to give him a plate of his own sweets that he doesn't have to stealthily swipe. my husband is such a good fatherand he would definitely enjoy some of those treats! we have never tried them before, so it will be an adventure for us all. My hubby played college baseball and it is his first father's day. He would love it. Dad= the father of my children...why I want to win this for him? 6-Although being in his fourth year of Vet school with the stress of rotations, studying, surgeries and the added stress of board exams coming up he puts his family first and makes sure we know how important we are. My husband just became a father to his first son 5 days ago. This is a very special Father's Day for our little family of four. My husband loves treats. This would be a perfect gift to satisfy his sweet tooth. Thanks! My husband is an amazing father and co-parent. He totally understands that Mom (me!!) needs a break and is always, always, always willing to step in and help. He never complains or shirks -- even when there's lots of slime involved. He wants so much to be the best dad he can so that our children grow up to be happy and love life. He's just amazing. My husband brings our son a "treat" every night when he gets home from work and my son says he would like to give his dad a treat sometime since he always brings him something and doesn't buy something for himself, too. My husband is the best daddy! And the best husband : ). He works hard to take care of us and manages to spend plenty of time with us. He cooks better than I do and is gracious to me when I'm tired. My dad loves cookies, brownies and every other type of treat. One time he ate clay thinking it was fudge for a midnight snack. I think he'd like this better!! I would love to win this for my husband because he works so hard so I can stay home with our two beautiful children. It's been hard but he is always willing to give up what he wants so we can have what's best. I want to win this for the dad at our house so I can have a break from making cookies all the time for him, he has such a sweet tooth for cookies, not to mention the kids!! Must win cookies!! My dad would love me forever if I sent him a basket of goodies for Father's day! Horray! I would love this for my husband because he is the sweetest husband and father a woman could ask for! I want to win this for my husband because he loves baked goods, but I hardly ever make them. He actually makes them more than I do. This is a way for me to give back to him. My husband is such a hands on dad. I didnt realize how good I had it, till he went out of town for 4 days and I was left with our wild 4 yr old! I really appreciate him!! of course, because (like all the others here) i think he is the best dad and husband around - who couldn't use a sweet treat!! I'd love to win for my husband. He'd love a sweet treat, and I just don't have the energy to heat up the kitchen with a 5-month-old and two preschoolers! Because it's sure to taste better than my baking and I think he will share some with me! My husband is the dad we are celebrating this year. We just had our first baby and his head is still spinning. He deserves to bury his head in a tin of yummy cookies! YUM! I wanna win because my husband is military and I won't get to see him until November. I think this would cheer him up! I'd love to win this for my husband, why? I guess just because it's he's a swell guy! YES, yes, yes, I would love to win this for my husband!!! He craves sweets all the time, and loves to try new types. Now with a new baby (and a toddler), I won't have time to bake for him this father's day. Besides I saw the pretty box, and tested the heavenly goodies from Dancing Deer for Christmas, so one more time: Yes, please. This is the first year our daughter is able to talk and my hubby is so good with her. He really enjoys playing with her and it's so great just watching them. I want to win because my hubby would LOVE all these cookies. And it would just feel oh so good to FINALLY win something! My daughter and I have both had horrible colds for the last several days, and my husband has been so sweet to take good care of us. He deserves an extra sweet treat this Father's Day. I would want to win this for my dad because my family has been through so much this past year and my dad has been so strong and faithful through it all. I cannot believe what an example he has been to stay faithful and stick together as family. I know this is probably boring but I know my husband would LOVE the chocolate chunk brownies! Yummy! it's my husbands 1st Fathers day! I'd like to win this for him because he's a great dad, a fantastic husband and a loyal friend! Plus, he has an awesome sweet tooth that would be helped by this gift. It also wouldn't hurt that he is also a great sharer! :o) Thanks for offering this! We would like to win because my poor husband has mono and could use a little cheer. I would want to win this for my hubby because the way to his heart is through good food. I would love to win this for my grandfather because to me he is my dad. He raised me along with my grandmother (who sinced passed away) since I was 18 months old. He is my dad, even though I know my father too. My dad was an umpire for as long as I remember. We always joked that when he died it would be on the diamond ump'ing a game. Baseball is his world. He was in all his glory when he was ump'ing. He even coached for many years too. I have nothing but very fond memories of my dad being an umpire. One time I remember I was there just with him and I was about five years old and I had to go to the bathroom. He actually left the field to take me to the bathroom because he didn't want me to go by myself. My dad has always been there for me and doing nice things for me and I would love to give his a "sweet treat" to let him know how very much he means to me. Thank you for this wonderful prize offering. My husband's father's day gift from last year is still in the box! I know these yummy treats will be out of that box before the day is over. My hubby loves cookies and I also know he has seen this company on the Food Network (his favorite channel!) so he would really appreciate this gift! Yummy! My dad has a major sweet tooth -- this is sure to win me some points with him! I so need this! I usually send my dad homemade cookies for fathers day...but I am sick with a stomach virus this year so no cookies. Love the idea, I hope I win! Oh gosh, these look good! I'd like to win this for my husband because I'm rather a haphazard cook and he's suffered through some of my more interesting baking adventures, this would be a well-deserved reward! My hubby is a food snob so these gourmet cookies would be a fun gift! The molasses clove looks especially interesting! I'd like to win this for my dad because every time I ask him what he wants, no matter if it's for his birthday, father's day or christmas... he always says COOKIES. lol. Thanks so much for the opportunity. I want to win this because we are tight on funds (as are many family's), so it's hard to get him something this year. I know he'd really appreciate the sweets and he's a great father to our kids. We are no longer together but he is still my best friend, I'd love to see him smile from this! I would love to win for my FIL, he loves when I bake for him but we live a couple of states away now. My MIL is a great cook but can not bake!! I would love for him to have some fresh baked goodies plus he is the best Grandpa ever!! Since I totally dropped the ball on my dh's birthday this could get me back in his good graces! My husband loooves cookies and brownies and he deserves to kick back and enjoy his day munching on these! so he'll share with me. My dad is such a great dad and grandpa. He loves to share his sweets with my son, who he hangs out with all the time. What a perfect gift for Father's Day. Count us in! Perfect my guy with the sweetest tooth in town...good luck all.. It is my hubby's first father's day, and he rocks! He never puts our 7 week old down when it's his turn to take care of her because he thinks she is just so sweet. So since he likes sweet things, this would be great for him! If so I would like to win this for the "daddy" in my life, my bf, who at the moment is the daddy of our 1-year-old adorable...doxie! We always call each other "mummy" and "daddy" when talking to our little Mila and we consider her as our baby. My wonderful Dad is 92 years old! He doesn't get around much now - his favorite "activities" are watching golf on TV and savoring a tasty snack. I would dearly love to be able to "gift" him with these fabulous tasty treats for Father's Day! My father in law is very slender and can use the calories--these would surely tempt him! They tempt me! I would share it with my wife and son if I win - that would be a great Father's Day! Mmmmm - I echo the first person's post; I want to win it for my husband b/c he'd share! :) Those blondies sound delicious! My husband is "The World's Greatest Dad" to our 3 children and this would be a great gift to honor him with for all he does for us. My husband loves chocolate beyond this world - this would be his ultimate gift! thank you for the contest. My dad understands me and helps me with my problems, he deserves treats like these. My dad is elderly and doesn't have much of an appetite so it's hard to get him to eat anything. But he always loved his sweets and keeps asking for them. This would really make his day! My husband is the best! He's been working so hard building a deck for our family, this after working all day! He's my best friend, a loving father & the best husband in the world! Plus, I know he'd share with me!! I would like to win this for my husband who will be coming home tomorrow for a two week leave. He has been gone for 6 months to Afghanistan with the Army. He will be meeting our son for the first time as he was born while he was gone. Our 3 year old daughter will be so suprised as we have not told her yet. He is such a good dad and loves his children so much. He would love all of the food as he has not had much of it in such a long time and it would be such a great Fathers Day gift. My husband lost his job at the beginning of the year. While he was able to find another one, it's 2 hours from our home. He's been commuting every day so that his kids' lives would not be too interrupted. He does this even though he is working 12 hour days. He gets home just in time to help tuck them into bed. Finally, now that school is out, we get to move to be together as a family. Just in time for Father's Day. My father is 85 and one of the few things he really enjoys now is sweets! Id like to win this for my husband because he works hard 7-days a week away from home to provide for us. He is a great father to our children. He deserves a special treat. This would be great for my Dad! He is a super big fan of brownies. I would love to give these to my husband because I know he would share them with me and the kids! my husband is haviny my kitchen remodelled and really deserves a nice treat like this. I would love to win this for my husband because he's such a caring man. He's a great person, great husband and great dad. He works long hours, some 70 hours a week to help me to be a stay at home mom. He's wonderful and I would love to win this for him. He's also a cookie and brownie monster and loves them. Thanks for offering this great giveaway. My Dad is all about sweets....prollie why he's such a sweetie. He'd love this basket! My dad rarely treats himself to anything. This would be a special way to thank him for all he did for me. I would like to win this to give to my dad because he loves cookies! I'd love to win this for my husband so I can sneak a nibble for myself! I would like to win so dad and I could share the yummy cookies and some glasses of milk. My daughter and I have to go out of town for Father's Day..this would be a great gift to leave behind for my hubby since we can't be with him that day. He's a junk food junkie and nothing makes him happier than brownies! Before my son was born, I had time to bake cookies and breads. My husband loved to come home to carbohydrates galore. But now that my son is toddling around in a perpetual state of motion, I never have the energy anymore to tend to batter and dough and a hot oven. So a medley of goodies for my hubby would be well-received, not only because it's a delicious treat, it might be the only baked treat he gets this year until I can figure out how to get my baking groove back. Do I can get out of baking. I would love to win for my stepfather, because he has a huge sweet tooth. I stay-at-home so I have to get $ from my hubby and I can never surprise him. If I won, he wouldn't know about it until it came and for once I will have surprised him! (He's a good dad and even cooks everyday after work). I would love to win this for my husband whos a great guy and always doing for everyone else He deserves a treat!!!! My husband LOVES chocolate! He would love to have all these baked yummies. Sounds like there are a lot of great dads out there. My husband is a great dad too and loves his sweets. This would be perfect for him. With a new baby, he just isn't getting so many deserts lately..He deserves this, and shoot, so do I! that would be awesome to give to my hubby, especially since I just don't have the talent of baking. I would love to give this to the "dad" in our family because I think he has felt a little left out lately. I am in my 9th month of pregnancy and most of the focus from family and friends has been on me. He would never complain about it, but I know he probably feels a little pushed aside. My husband who definitely deserves them. I would normally do my baking on the day before the holiday, but this year, I won't be available. I'm participating in the American Cancer Society's Relay for Life, which lasts 24 hours. (A member of each team must be on the track at all times. Like many of our team, I intend to stay available for the entire event.) The event in our town is on June 14-15. So the morning of Father's Day, I expect to be coming home too tired and sleepy to bake. My husband would love this for father's day! I looks so good!!! And My husband will share with the 2 kids and me!!! Yum! My dad would love this prize! Cause my dads tearing off his old ashalp roof and replacing it with a tin roof so its better for the earth and he needs this cookie for the energy the sugar would give him to complete it. This would be a great gift for the dad of our house. He's certainly earned it. Sweets for my sweet...I definitely show my love through treats! I want to win this for my hard working sweet husband of 27 years! He is a daddy of 4 good kids and could use some sweet stuff for all he puts up with from them! I would say that I want this for my husband because I didn't have another gift for him yet, but now I do. Still, two gifts would be great. He deserves all that I can give him! My dad has a huge sweet tooth, he'd love this! My husband loves sweets and takes me so high,yeah so high. I would love to win for my husband, the father of my wonderful children. Actually, if I won, my kids would be giving them to him as a gift since my husband is such a sweet freak it's not even funny. He has to have chocolate ice cream every night before bed. That or some sort of chocolate cookie, donut or brownie. This would be the perfect gift for him on father's day!!!! Would love to share this my 4 sons, 3 of which are also fathers. I want to win this medley for my Dad because he deserves a treat for everything he does for our family. Recently my brother and sister both graduated from his alma mater! Dad has supported us over the years and now that we're young adults, we appreciate him even more. This would be an awesome Fathers day gift for my husband because we are getting ready to try for baby number four and he always caters to my every pregnant craving and need. This is my chance to say thank you for indulging me by letting me indulge him! Thanks for honoring the great men in the world! I would like my hubby to win because he is a big grumpy bear of a man who loves his kids dearly. My Mr. Wonderful works two jobs and goes to school and still has time to be home with our 2 girls. He has amazing patience and always let's me be creative. I would love to show him what a "sweet"heart he is. First I hope I didn't post twice; I accidently pushed submit when I wasn't finished!! My hubby so deserves these sweet treats. After 18yrs, 4 daughters (his,mine,ours), my depression, a suicide of someone very close, we are still best friends and he makes me laugh every day. I husband loves chocolate and this would be great for him. He works very hard so I can stay home with the kids and home school them. This would be a great way to let him know we are thinking about him. Thanks for the chance to win this for him. Repeat after me. "This is a gift for dad. This is a gift for dad. This is a gift for dad." I would like to win this for my dad because I know he'd share it with me. LOL Seriously though, my dad has a heart of gold and growing up I always knew he'd spoil us rotten, but NOT by buying us things and taking us places. He always gave us the love and attention we craved. Because my husband took my daughter shopping for her first bra while I was away on business. Yeah, he deserves some chocolate. Nothing beats cookies as a gift for my husband! He is the hardest worker and a darling daddy to our three kiddos under 2 years old! Pick CHRIS! My husband loves his sweets. Usually he's the one doing the baking. It would be so nice to present him with this collection of goodies that he didn't have to make himself. He deserves a treat. I would LOVE to win those sweets for my husband because he is soooo SWEET and I am sure he will share with me and our adorable daughter ZOE! keeping our fingers crossed! I'd like to win this for my husband because he is the sweetest Dad to his little baby girl. He will be with her all summer and I think it will be really great for him. Plus, he has quite the sweet tooth. My dad deserves this because for 28 years he has been an incredible support to four sometimes challenging kids and sacrificed since the day he found out he was going to be a father when he was 18 years old. He created a home with my mother full of love, laughter, lessons and life and never gave up on us, even when we gave him every reason to do so. I measure every man I date against him. He has been the best provider, coach, cheerleader, hugger, leader and friend any of us could want! And he LOVES cookies! I would love to win these for my hubby, who is a sweet freak! He is also the best father ever - very loving, gentle and patient. I am thankful to have him in my life. I'd like to win this for my dad because he loves baked goods. I would like to win these for my dad because he works hard and deserves a treat. Plus, he's almost as much of a sweetsaholic and chocaholic as I am. Thanks for the giveaway. The dad in my house sure does love the goodies, he's flip for this basket. So yummy!!! I want to win them for my husband and dad so we can all eat them together when we visit! I want to win one because I am having trouble thinking of a great Father's Day gift! And he loves cookies. tangled and true& dancing deer rocks! I would love to win this for my father. He has this craving for cookies specially chocolate. My dad deserves this! My mom and I are both on a diet and now he's on one by default. Some sweets would really pick him up. I'd love to win this for my husband. He just recently got moved from a day shift to a swing and was more upset about the move because he wouldn't be here to help with our boys at night (one of who has autism). He just a good dad and deserves it. Thanks for the giveaway!! My husband, me and our two children were in a car accident last week. All he keep saying was are the kids okay? He's such a sweetie. Speaking of sweets, we could use some love sent our way. I am a long-time lover of Dancing Deer! My son, Thomas, and I would like to win this for my husband because when he is deployed we know even more what a wonderful man he truly is. I have to be mom and dad when he is gone and his shoes are hard to fill. He makes us proud every single day and this would just be a great gift to surprise him with on Father's Day. I would love to win this for my husband because of all he does for us. I became disabled about 3 years ago he took an extra job to support us. Because he would love this gift.